All the components required to assemble a Hettich Atira drawer box with glass design sides, all you need to add is your fascia. With most drawer manufacturers, if you have cabinets constructed with 15mm sides, you have to place packers behind the runners to ensure a correct fit. 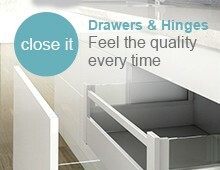 Hettich have cleverly resolved this issue with different width drawer runners. 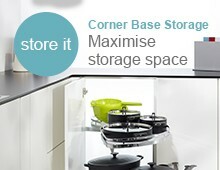 When ordering; if your cabinet sides are 15mm, please choose the Related Runner Product, listed below. 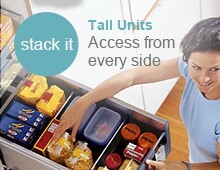 You will need one per drawer. 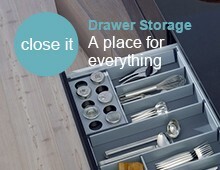 With a large choice of drawer depths, there’s something for everyone. Our stock size is 480mm and available for next day delivery. All others sizes are usually delivered within 5 working days. 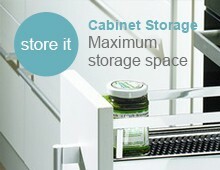 Each drawer box is designed for cabinets with either 18mm or 15mm thick sides. Please select the appropriate option when ordering. 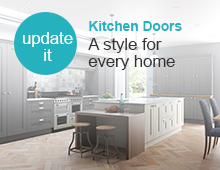 For handleless furniture, you may wish to upgrade to push to open Quadro runners, please see runner options under Hettich drawers.